Atlanta Streets Alive, 2012. Photo: TJC. You’ll never look at a street the same way again after you’ve seen it filled with smiling people. From Delft to Bogot? to Pittsburgh, the vision behind the modern open streets movement is to give more people vision: to make it clear that we can rewrite the rules of our streets any time we want. Next month, a city with one of the most successful open streets events in the country, Atlanta, will host the Open Streets Summit to help city officials, advocates and other open streets organizers build better such events. 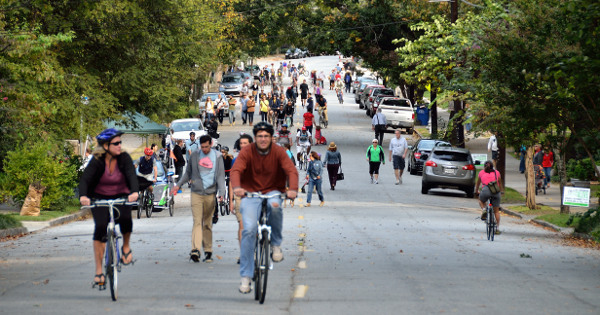 “Open streets transform streets usually reserved for cars into vibrant places where communities meet,” said Rebecca Serna, executive director of the Atlanta Bicycle Coalition, which is hosting this year’s event. We’ve reported on the ways advocates in Minneapolis and elsewhere have used open streets events to build public coalitions around protected bike lanes; that’s just one of the ways these events can help drive permanent change. The conference’s full agenda went up last week. It includes breakout sessions on fundraising, route design, live demos, and ways small-city events differ from big-city ones. Plenary presentations will present lessons and inspiration from some of the world’s best open streets events: Atlanta, Los Angeles, New Brunswick and Bogota. The summit is Friday, Sept. 25 to Sunday, Sept. 27. Registration is $395 (less for members of the Alliance for Biking and Walking) and continues through Sept. 4.